American Homeowner Preservation has raised money from high net worth “accredited” investors since 2011 and consistently generated above-market returns, both financial and social. This past January, we set out to take the next step in our growth and raise institutional capital. We kept hearing that institutional investors were chasing yields. But how could we get them to chase us, or even listen to us? The steps were to connect, differentiate, produce, wait, and close. Connecting is the first and most essential step. 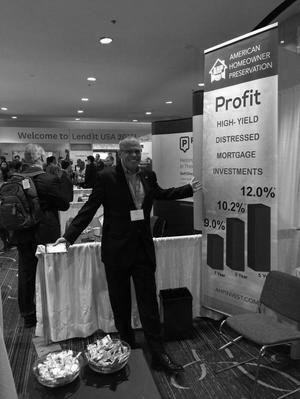 We registered to attend several conferences, including the Triple Bottom Line Investing (TBLI) conference in Chicago in January. As is common for many conferences, we received an attendee list prior to the event. We perused the list to identify attendees associated with investors and fund managers, and proceeded to connect with them via Linkedin: “Do you have some time to meet during the TBLI conference? I’d like to share American Homeowner Preservation’s opportunity with you. We buy pools of defaulted mortgages from banks and offer sustainable solutions to keep families at risk of foreclosure in their homes.” Some did not respond, others requested copies of our pitchbook, and a few agreed to meet. One of the latter was Benjamin Bingham, Founder and CEO of Scarab Funds, a socially responsible investment fund. Bingham proposed meeting the evening before the conference. We met at a local coffeehouse and quickly engaged in a conversation about the ongoing and devastating impact of the foreclosure crisis on America’s low- and moderate-income communities. I was differentiating AHP from other distressed mortgage buyers, most of whom prefer to purchase loans secured by higher-end homes. Instead, AHP buys the mortgages secured by homes typically worth less than $75,000 and often located in America’s most challenged communities. We execute borrower-friendly strategies based on my personal experience as a struggling debtor — a decade ago, after a natural disaster triggered my financial collapse, I owed over $26 million in debt I couldn’t pay. This is AHP’s edge and what makes us different. Over the next several weeks, Bingham and his Scarab Funds team asked for documents and data. We quickly learned that institutions have extraordinary data requirements. To satisfy these requests, we hired a former Bear Stearns analyst to produce financials in formats that institutions are accustomed to. Next, Bingham contracted a third-party company to complete additional due diligence. Subsequently, we generated even more documents and data, and answered several queries regarding our operation, structure, and other details. Bingham then shared the good news: Scarab Funds was ready to proceed with an investment. However, I learned that funds strive to minimize capital sitting on the sidelines in a bank earning almost nothing, instead of annual returns such as AHP’s 9 to 12 percent. To wit, Scarab waited a few weeks on the liquidation of another investment and then immediately redeployed those funds into AHP. On July 24, more than six months after we started our quest, we had our first institutional investment closed. Institutional dollars in six months is reasonably speedy. AHP is working with four other prospective institutions, which are all in the due diligence phase. We are optimistic that more institutional capital is in AHP’s future. Connect any way you can: conferences, social media, cold calling and emailing pitch books all can yield interest. Differentiate by demonstrating your edge: Why are you different? Why are you better? Be prepared to deliver detailed financials on your past performance, as well as data and analytics to help share your future. Patience is essential. If you can do all this, you increase your odds of getting an institutional investor to fund and close. Eventually — if all goes well — you might even get institutional investors to chase you.